For the past few weeks there have been a lot whisperings and shutting doors in our home. 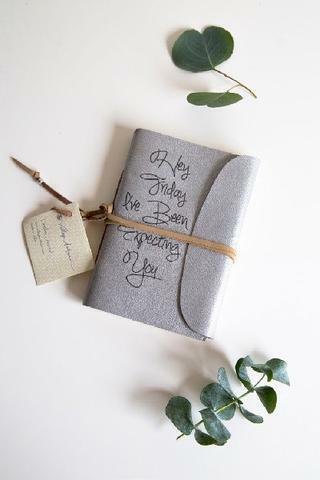 It happens every year as we realize that if we’re going to make the handmade gifts we’ve been “thinking” about all year, we’d better get on it. Every year we say we’re going to start our gift making during the summer, then summer comes and goes with no gifts being made. But we’ve been thinking and sometimes that’s the hardest part. Part of why the thinking is challenging is that we try really hard to make sure our handmade gifts are useful to the recipient. We don’t want to give someone a gift that causes them stress and they feel like they have to keep because one of us made it. We want the gifts we give, whether handmade or bought, to bring joy to the receiver. Before I give the wrong impression and lead you to believe that we make all our gifts, let me assure you that we don’t. We don’t have the time nor do we have the skills make everything we want to give as gifts. But we also don’t just rush out to the mall and load up. One of the ways we give handmade gifts without making them ourselves is by purchasing handmade items from other small businesses. 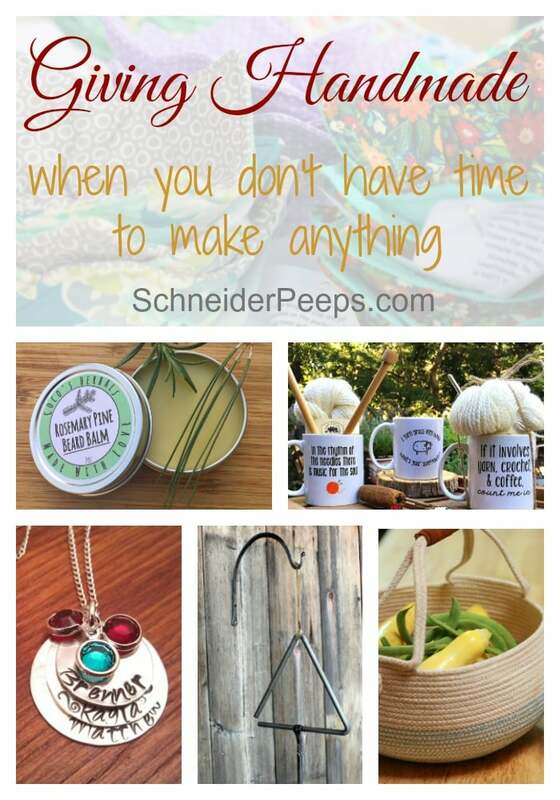 Today, I want to share a few of my favorite handmade businesses. These are all businesses that I can whole-heartedly recommend. Let’s start with Ruby Mozelle’s Quilts which is owned by my sister, Michelle. 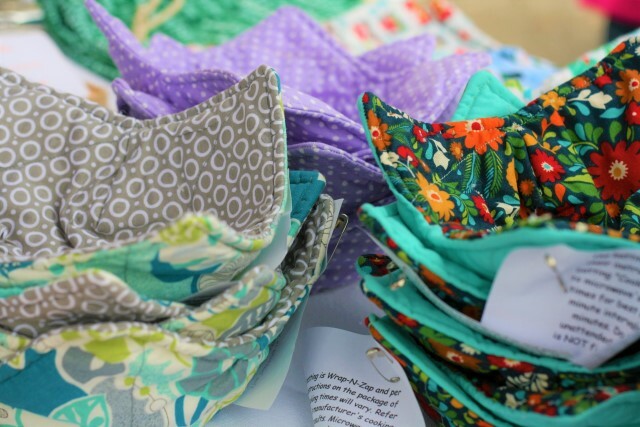 Ruby Mozelle’s Quilts is named after our paternal grandmother who was an amazing quilter. It makes me smile that Michelle named her shop after our Granny who was the crafty influence in our lives. But quilts are not all that Michelle sells in her shop. 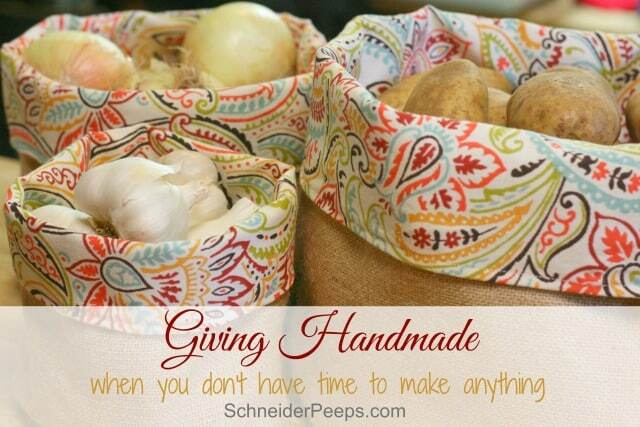 She also has quilted goods such as journal covers, casserole carriers, bowl cozies, and quilted coloring pictures. A Little Bit of Faith is an Etsy shop own by a Faith, who also happens to be an “in real life” friend. 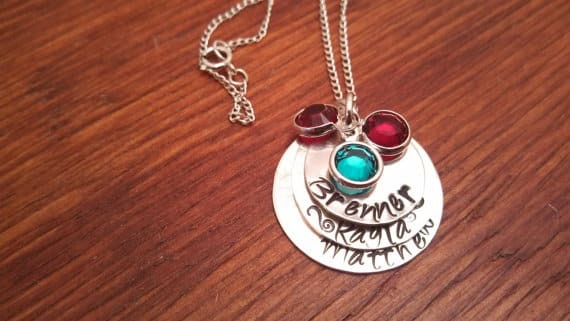 She makes amazing hand stamped jewelry that is personalized just for you. I love that the discs can be layered so you can write more without it being big and gaudy. I also love that Faith is happy to try new things and stamp just what you want. 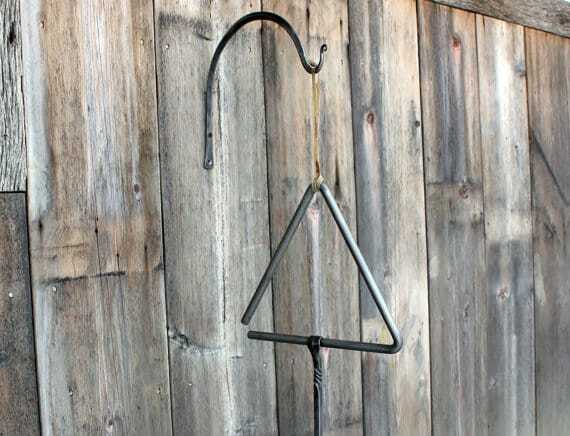 Acorn Hill Handcrafts is owned by Teri from Homestead Honey and her husband and specialize in hand forged metal and wood items for your home. We have the dinner bell and hanger set and I was surprised at just how heavy it is. We had an old dinner bell years ago when our older children were little and it got lost in one of our many moves. Carl has mentioned it several times since we’ve moved here and was so surprised to open it up on his birthday. Now all we need is to build the covered porch I want and our outdoors will be complete ;-). But rustic dinner bells isn’t all they have; they also make decorative curtain rods, hooks, bottle openers, and black walnut cutting boards. Timber Creek Farm and their “free range” yarn always makes me giggle. The owner, Janet who writes the blog Timber Creek Farm, is pretty passionate about her animals and it shows in her products. She sells yarn that is not only homegrown but is also hand dyed using natural dyes such as poke-berries and turmeric. 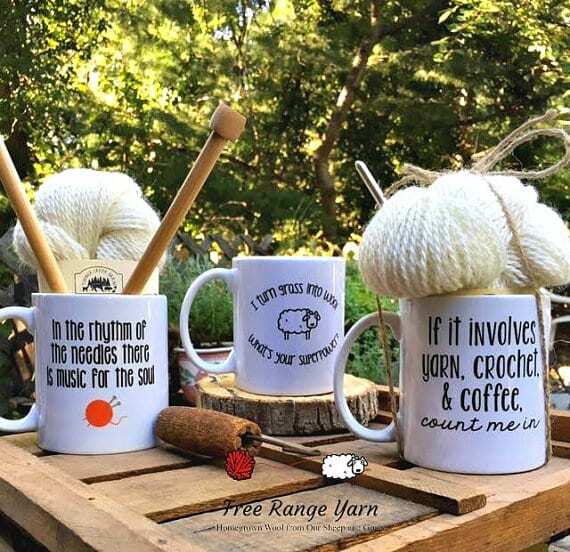 I can’t imagine a nicer gift to give to your favorite knitter or crocheter than this yarn…well, maybe the yarn with a cute coffee cup, but she has those too. If you order by December 31st you can get $5 off a $50 by using discount code 5off50 at checkout. 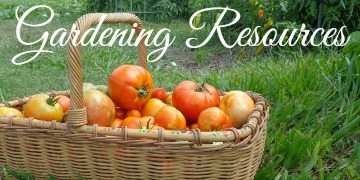 Reformation Acres is owned by Quinn who writes the blog, Reformation Acres. 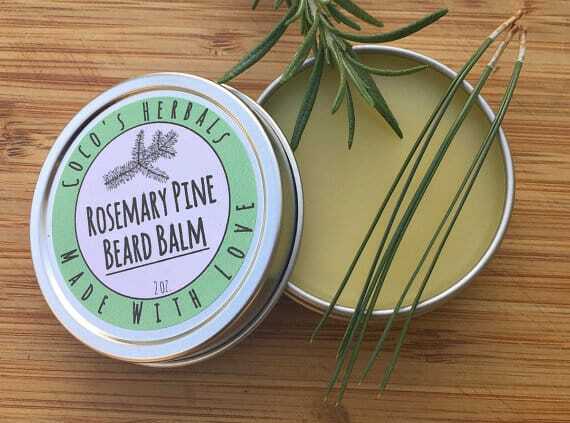 Quinn sells hand crafted salves, beard oil, lip balm and soaps. The soaps are luxurious! In fact, Quinn’s soaps are the reason I’ve yet to try my hand at soap making. I love her soaps so much, I’m afraid I’ll go to all the work of making my own and not like them as much. 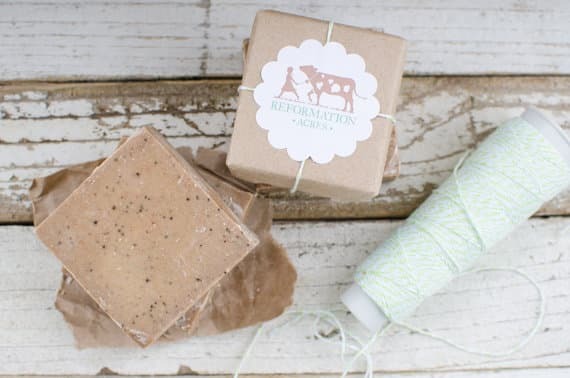 If you think handmade soaps leave a residue on your skin, you’ll be in for a wonderful surprise. I’m often asked by guests if it’s really handmade soap because it rinses off so well. My favorite is the Cafe Au Lait and my sister’s favorite is the Purely White soap. Quinn also makes beautiful and functional harvest gathering aprons. 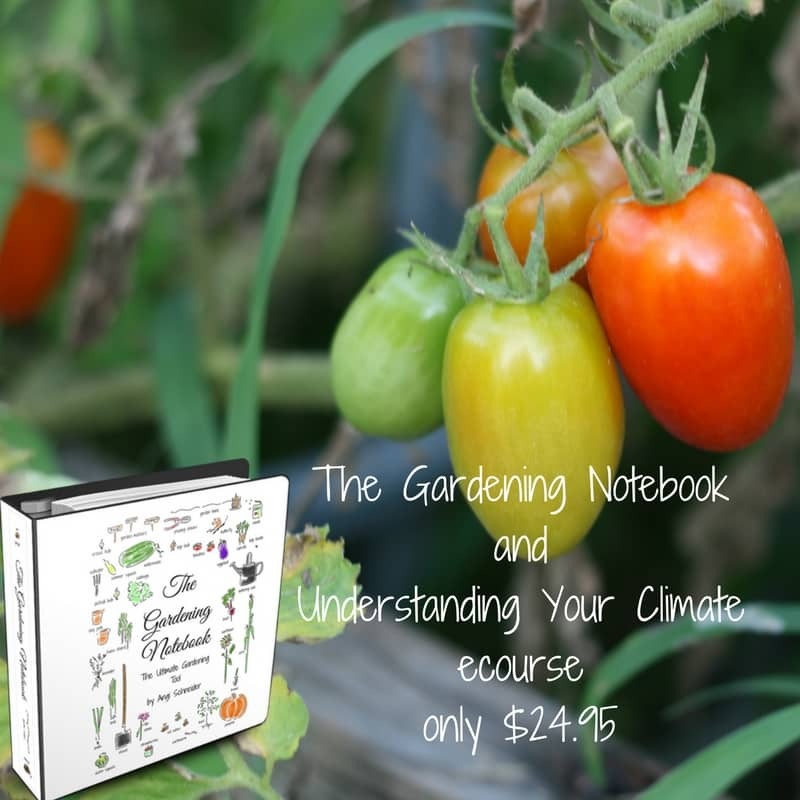 This would be a great gift for the gardeners on your list. If you order before December 20th and use discount code “GIVINGTHANKS” you’ll receive a 30% discount. Coco’s Herbals is owned by Colleen of Grow Forage Cook Ferment and her balms and salves are pretty wonderful. Last winter I traded some organic Meyer lemons for some of Colleen’s products and was super happy with the them. 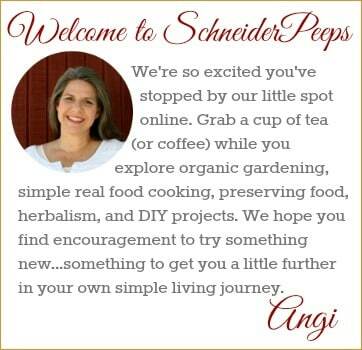 She makes lip balm, herbal salves and a beard balm. I think the beard balm would make a great gift for anyone with facial hair…or his wife. Before we move on from Etsy shops, I want to mention that our shop will only be open through December 5th and won’t re-open until the beginning of January. So, if you are planning on getting harvest or produce baskets for Christmas, please order by December 5th. 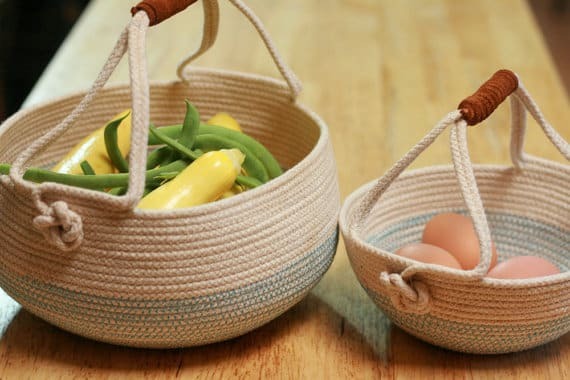 We have several styles of rope baskets, and fabric and burlap baskets available. Okay, I’m going to have to restrain myself when I tell you about Mercy House Global because I could really just go on and on. Mercy House Global is a non-profit organization that helps sell handmade items made by impoverished women around the world. I have the journal above and it’s super cute. In fact, it’s so cute that our teenage daughter confiscated it for her typography practice. They sell individual items and they also sell several different monthly memberships. We get the Fair Trade Friday box each month and set aside some of the items for Christmas gifts this year. They have jewelry, leather goods, clothing, games, bags, wallets, etc. Here’s the cool thing, each item has a tag with information about the person who made the item. Sometimes it’s just a name and sometimes it’s more, either way, I can pray specifically for that person since I know her name and a little bit of her situation. If you haven’t ever looked at their site, please click over and learn about the fantastic work they are doing. This one is a little different but I want to make sure you know about it because it might be a really great deal for you. The Ultimate Bundles team has but together a bundle of gift certificates to 12 small (mostly handmade) companies and are offering the bundle to you for $15. The great thing about this bundle is that all the certificates, except one, are for physical items and there aren’t any special restrictions on the gift certificates. They can’t be used to offset shipping costs but there aren’t any minimum purchase requirements. However, don’t just buy the bundle because it’s a crazy good deal, click over and make sure you will actually use the certificates for two or more of the companies. This will only be available through December 5th.